A ten-strong team from wealth manager James Hambro and Partners (JH&P) fought through sleep deprivation and harsh weather to complete the 177-mile Ragnar relay run on Sunday 23 September, raising over £5,000 for the charity ‘Greenhouse Sports’. Ragnar is a series of relay runs held across the world in places of natural beauty. The ‘White Cliffs’ run began at midday Saturday in Sittingbourne and carried on through the night, finishing in Brighton on Sunday. Partner Rosie Bullard runs through the rain and pain. JH&P matched all workplace sponsorship to help support the team, several of whom were novice runners. The funds raised will go to JH&P’s corporate charity partner ‘Greenhouse Sports’ to support their work helping young people build confidence, teamwork and leadership skills and improving fitness and physical wellbeing. Since 2002 the charity has helped over 40,000 young people from deprived backgrounds. 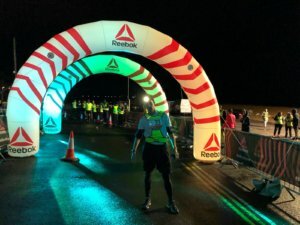 The night run – financial planning consultant Ned Francis on the overnight leg.